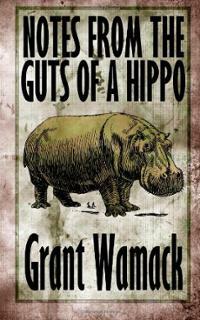 While many authors need to take their narratives into different planets in order to infuse them with uniqueness and a sense of the extraordinary, Grant Wamack decided to explore a new possibility and found his otherworldliness inside the belly of a hippopotamus. However, the existence of a different dimension inside the belly of a large, somewhat violent, and mostly herbivorous mammal is only the tip of the iceberg when it comes to strange elements in Wamack’s work. Notes From the Guts of a Hippo tells the story of Jay Robbins, a journalist who’s sent to the dangerous jungles of Brazil on a mission to find a missing hippopotamus researcher and write a news story about him. Once he gets to Brazil, Robbins sets out to find the scientist along with Eric, his translator. Instead of finding the man they went looking for, the duo stumbles upon a mythical breed of hippo, the Lastiz, which contains an entire world within its guts. After a gruesome entry, their search begins again, but things immediately start to get complicated. What follows is a crazy, fast-paced narrative full of danger, weirdness, assassins, and a new mission for Jay, one that could impact the world he left behind in a more significant way than he could ever have imagined. Bizarro is the genre of the weird, and Wamack delivers plenty of that in this book. Between Eric becoming an undead collection of meat and body parts, the world inside the Lastiz, and fingers growing from Jay’s back, there’s enough strangeness to keep fans of the genre happy. However, the straightforward storytelling, bits of humor, and the sense of adventure that comes from the narrative make Notes From the Guts of a Hippo a read that can be enjoyed by readers regardless of their preferred genre. While many young writers want to throw as much action as possible into a narrative regardless of how that affects the storyline, Wamack is different and, despite the fact that this is a bizarro book, he takes his time setting up the premise, introducing his characters, and even giving the story a perfectly credible beginning before everything becomes surreal. Notes From the Guts of a Hippo is a novella, and thus suffers from some of the problems that are intrinsic to that format (i.e. not much space for characterization, no rich explanations, quick resolution, etc.). However, the action is non-stop and the premise is so original that none of those things becomes a problem. Reading books that follow the rules can get boring, and this is where Wamack comes in. Notes From the Guts of a Hippo is an invitation to drop and preconceived notion of what an adventure story should be like and just enjoy the ride. Also, considering this is the author’s debut, lovers of uncanny literature should add Grant Wamack to the list of writers whose work they should always check out.